The lecture will explore the cognitive, social and emotional benefits of reading and in particular will focus on how, when teachers share their reading lives and books in common with children, new and closer relationships develop reader to reader and human to human. The 4th Ultimate Wellbeing in Education Conference with Damian Hinds MP. Through discussions and advice from a range of leading wellbeing and education experts attendees will leave with a thorough understanding of the need for wellbeing education and practical ideas on how to implement it in their schools. 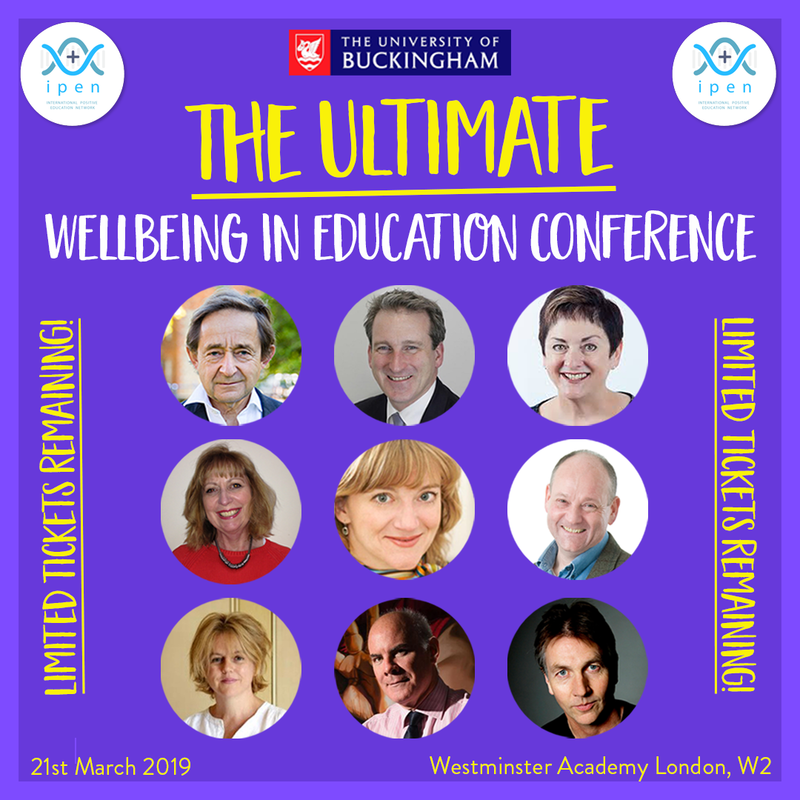 Join us for this one-day event hosted by Sir Anthony Seldon (Vice Chancellor of the University of Buckingham, President of IPEN, and co-founder of Action for Happiness) the event will begin with a keynote address by the Secretary of State for Education, Damian Hinds MP. Damian Hinds MP will start the 4th Ultimate Wellbeing in Education Conference in association with IPEN and the University of Buckingham speaking about his plans to introduce wellbeing into all schools from primary upwards. The day will then explore the importance of student and staff wellbeing and offer ideas on how it can be improved. It will also allow for networking opportunities with members of the IPEN network, other wellbeing leads, senior leaders and teachers. Joining Mr Hinds in a day hosted by Sir Anthony Seldon, will be Prof. Russell Foster, Rachel Kelly, Lorraine Thomas, Mike Buchanan and other key mental health, wellbeing, and education experts. A short video from my recent visit to the Tower of London while recording a podcast for the National Association for Primary Education. Are you a recently qualified early years / primary teacher (QTS gained since June 2016)? Are you keen to reflect on your professional development as a classroom practitioner? Are you keen to get something published in an educational journal and add it to your CV? What do you see as the key principles and/or values which inform your approach to learning and teaching? How can teacher retention be improved? The global teacher for the 21st century. The article should be between 1500 and 2000 words and you are welcome to select your own focus and title, but drawing on one of the above themes. The article should both critically explore aspects of your own experience and identity as a recently qualified teacher and be informed, where appropriate, by relevant literature. Your personal voice is seen as a key dimension of the writing. The final date for submission for this academic year is 1 May 2019. It is to be submitted electronically in Word or PDF format to Robert Young, NAPE General Secretary at rmyoung1942@yahoo.co.uk. The Primary First Editorial Board will judge the submissions and it is anticipated that more than one submission will be considered for inclusion in the journal, although not in receipt of the Award itself. Further details about the Award can be requested from Robert Young. As a result of a very generous bequest from the Rosemary Evans estate, the NAPE Council decided to make an annual award of £200 for the best article received from a recently qualified early years/primary teacher in the United Kingdom on a theme which we hope has particular salience for recently qualified teachers. The NAPE journal, Primary First, attracts contributions from distinguished educationists as well as current classroom practitioners at different stages of their careers and we see contributions from new teachers as making an important and very welcome contribution to educational discourse. We are pleased to announce that since the annual award was introduced in 2016, two primary teachers, new to the profession, have had their articles published in the Journal and have received the award. it address aspects of the author’s own experience as a teacher with a perceptive and critical eye. it draws selectively and cogently on elements of relevant literature (which might include local and/or regional documents, published articles, key texts etc. ), acknowledging sources, where appropriate.